and light right do they? I'm not up on what's become of the character in the last decade. Is he officially no longer referred to as Captain Marvel? If so, what do other characters actually call him? Do they call him Shazam? If so, how do they know to do that? Surely, he can't tell anyone, "Hi, I'm Shazam." As of right now, since the New 52 reboot, he's "Shazam." I think he has to SHOUT "Shazam!" in order to become super or not-super. I don't remember. His whole new origin/personality read like Geoff Johns was writing it at gunpoint, so to speak. "Try really hard to make this character popular and cool or else!" Yes, based on the Nu52 comic, and presumably also in the film, the wizard is named Shazam, and when Billy says the word "shazam", he turns into a superhero, whom is also called Shazam. They get around the problem of how he can refer to himself, by saying that now it's not just saying the word that causes the transformation, it's also based upon his intent when he says the word. So if wants to transform into Shazam when he says the word Shazam, he will. And then if he wants to change back into Billy when says the word Shazam, he will. If he doesn't want to change in either form, he can say Shazam and nothing happens. Yeah, it's lame, which is why I've said that although I understand DC's reasoning behind using the name (my 49 year old brother, who also loved the trailer and wants to see the film, said he used to think the character was called Shazam too), I'd rather they'd just come up with some new superhero name for him ("Captain Thunder? "), and kept "Shazam" as just the magic word. He also has other powers he can trigger by saying Shazam, if he wants to. Like when in the Nu52 comic, he temporarily gives Freddy, Mary, and their other foster siblings, superpowers like his, by saying Shazam. Although none of them are referred to by a superhero name during that time. Which does raise the question of how future films or comics will handle bringing in other "Marvel Family" members should they chose to? Does Freddy become Shazam Junior, and Mary become Mary Shazam? The Figures Inc. Mego-style action figures do call Freddy "Shazam Jr." on the packaging while "Mary Marvel" somehow retained her own name. Other figures out there call Freddy "Captain Jr." and Mary either simply "Mary" or "Mary Batson." is 1000's of years old. That's pretty much what happened in Black Adam's only Golden Age appearance. Jabari Lamar said: Yeah, it's lame, which is why I've said that although I understand DC's reasoning behind using the name (my 49 year old brother, who also loved the trailer and wants to see the film, said he used to think the character was called Shazam too), I'd rather they'd just come up with some new superhero name for him ("Captain Thunder? "), and kept "Shazam" as just the magic word. The name "Captain Thunder" is also trademarked. I understand that people may think the hero was called Shazam if they've seen only the 7-11 glasses or some such, but he was called Captain Marvel in the TV show everyone says they remember. my friends watched it and NONE of them called him “Captain Marvel”. eyerolls when I’d correct people. I remembered the show when I saw the poster for "The Death of Captain Marvel" and thought the costume and indeed the death was an interesting direction to take the Saturday morning super-hero show I remembered. Count me as one who likes Shazam more than Captain Marvel, even though I know it's wrong. Shazam is cool and unique has far more branding power. Captain Marvel just doesn't make sense....it doesn't fit his powers, his origin, nothing. It feels very random. He'll always be Captain Marvel to me, but SHAZAM! is a great name for a superhero. Or a rock band. Or a newborn baby. I was one of those kids who called him by Shazam. I didn't have much history, if any, with him thru comics at the time so the title of the show probably swayed me towards the 2 instead of 4 syllable name. Also to this day I say Shazam with a southern drawl, thanks to me hearing it first thru Gomer Pyle. This thread is making me physically ill. 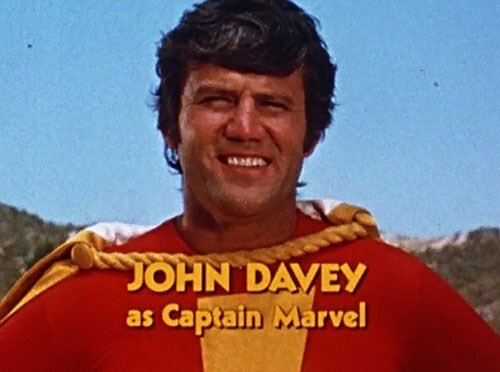 When I was a kid and watching the SHAZAM TV show back in the 70's, I kept wondering why they kept calling him "Captain Marvel" instead of "SHAZAM" in the show (and later, in the comics). I eventually realized that "SHAZAM" was just the title of TV show and comics, and accepted it and enjoyed the show and his comic book appearances. Heck, when you think about it "SHAZAM" (or the "The Power Of SHAZAM") is the perfect title for a comic book,TV series,or movie that usually features a team/family of characters who get their powers from the same person/source and it's why he should always be called "Captain Marvel" and not "SHAZAM". Yes, I always liked The Power of Shazam! as a series title for that same reason. It was a nice umbrella title, which could fit any character who was given power by Shazam, the wizard. I also liked Billy Batson and the Magic of Shazam! as a title (& I knew the guy who was the colorist on that book). The dumbening of America on full display. Wow, some are being a little rough on 7-9 year old kids from the mid-seventies. Well, there was no wizard in the TV show. They were already on thin ice for thinking the name of the monster was Frankenstein. Hey, most people I know think the monster is called Frankenstein! And they’re all way old enough to know better! I am minded to agree with Brian H. and the other "old timers" who are quite certain of the differentiation between Shazam and Captain Marvel. It was just an easy thing to understand... Billy and Cap were two separate entities. DISCUSSIONS: Maybe the weirdest treatment of this that actually used Captain Marvel was the second Frank Miller "The Dark Knight's Return Strikes Back Again", or whatever the second trilogy was called. Captain Marvel could never transform again, because... Billy was dead. I guess at his last moment, he whispered "Shazam" for the last time and made the final change. Worse, in that Dark Knight trilogy, Captain Marvel has to create an explosion or some such, so he changes back for the last time... and the lightning bolt causes physical reaction to the real world. TANGENT: Billy (and Mary and Freddy) changed back and forth thousands of times without their magic lightning doing any collateral damage. But in the Bronze Age, someone* thought, "Hey! We could have the bolt do damage! It could hurt Superman! Let's do it!" 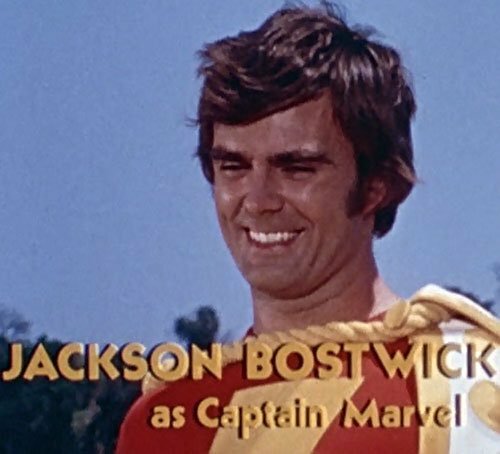 It was never the real Captain Marvel who did it, but still... c'mon! Let's be consistent at the least. Also, it could have been worse. What if some producer had had the bright idea of making Billy and Cap independent entities... and make them jealous of each other? So that Billy would never want to change, or that when he absolutely had to that Cap wouldn't change back, but try to establish an adult life for himself? This is another DC movie that I doubt I'll go to see. Their recent track record has just made me too distressed to go blow more good money on these travesties in a theatre. Maybe when it comes to cable. Personally, I've always loathed the idea that Billy and Captain Marvel are two separate people. Hate it with a passion. To me, the biggest appeal of the character, and what made him the ultimate "wish fulfillment" hero, from the moment I discovered him, was the idea that I, as a little kid, could say a magic word (and believe me I tried, many times. ..) and be transformed into an adult with super-powers. I didn't want to say a magic word and then, what? Disappear in limbo, while some other guy took my place and had all the fun? What's cool about that? So I just always mentally ignored any previous examples where Billy and Cap appeared to speak of the other as different people, and have been happy that the majority of post-Crises DC appearances (including the upcoming film) have had them as the same person in both bodies. I remember being very disappointed when I got the first issue of Jeff Smith's Shazam miniseries, which I had been waiting for for years by then, and saw that he was portraying them as separate beings. So I didn't buy the rest of the issues (although many years later I got a cheap used copy of the trade, just to keep my Captain Marvel collection in tact), but then I was happy that the follow-up ongoing series, Billy Batson and the Magic of Shazam, ignored that aspect and had them both as one again. So, yeah, sue me, but that's my preference. I will say I also never cared for the idea that the "magic lightning" that transformed Billy (and the others) was actual physical lightning that could cause damage. I think I first saw it in some pre-Crises DC comic, where Sivana managed to engulf Fawcett City in force field, that blocked anything from getting in, including the lightning, so Billy, Mary, and Freddy couldn't change. And then of course there was the Kingdom Come fight, later replicated on the Justice League cartoon, where Cap uses it was a weapon against Superman, by saying Shazam and then moving out of the way so that the lightning strikes Superman instead (although I fine with the idea of Cap being able to shoot lightning from his hands). And later portrayals would show Billy or Mary or Freddy having to run outside (if they were indoors) to change, because they wouldn't want the lightning to smash through the roof of wherever they were. To me I always just envisioned the lightning as a special effect, like the glow when Wonder Woman spun around on the old TV show.